Tributes, Twitters, Tweens Screaming, Trimming Trees with CDs, Awards and that Delta Video with the red headed lady and smiley guy! OMG!!! – Does it get any better? Oh yeah, a possible track list of Christmas songs! Hold your breath, count the days (44), 1056 hours, 63,360 minutes and David’s Christmas Album will be here before we know it! Ha! Ha! Not really, it’s going to drag on for an eternity! But every week I will post the remaining days left. A Countdown! But until then Honeybees let’s rewind David’s past week and enjoy! Popstar Magazine – Top 100 The Hottest Stars! Drum roll please……. David Archuleta will be honored at next month’s ALMA Awards, which celebrate Latino achievement in entertainment. The 2009 ceremony, being held Sept. 17 at UCLA’s Royce Hall in Los Angeles, will be emceed by comedian George Lopez and Desperate Housewives star Eva Longoria Parker. The show will air September 18 on ABC. David will be recognized as this year’s “Male Rising Star”. David is also set to perform at the ceremony. David seemed to have a grand time at the brunch at Dave and Busters in Providence, Rhode Island. He was very sweet to some adorable little girls. As of this date Amazon has David’s Christmas Album at #4 for Holiday Music! Come on Fans, we can do better than that! We need to get David to #1!!! Order his album for those people you always forget until the last minute, mail carrier, newspaper delivery person, hair stylists, that nice person at the bank that always helps you, the guard in your office building, the person at your parking garage that you sometimes overlook and what about the Santa who rings the bell in front of your grocery store or holiday mall. I know these are tough economic times, so give a few more albums if you can!!! HDD Updates – June 2009 – Album sales in the United States – Over 725,000 and Worldwide over a 1,000,000. David is getting close to platinum!!!!! DavidArchie – Recording the next few days in Utah!! Woot Woot! DavidArchie – Everyone welcome Mr. David Cook to twitter! You can follow him at @thedavidcook. DavidArchie – Been in the studio recording!! I love the Studio! Well at least today I do haha. kbestor- Headed to studio to produce David Archuleta on our final Christmas track. Been looking forward to this song and hearing his take on it. DavidArchie- Another day of recording today! I think this is my 1000th tweet, right? Haha! gettin’ into the Christmas spirit now! DavidArchie – Feeling sleepy today. DavidArchie – I’m singin’ in the boooth, I’m siingin’ in the boooth, What a marvelous feeling I’m haaappy, agaain! DavidArchie – Long day in the Studio, Almost finished for night though! DavidArchie – Another day in the Studio todaaayy. Mmmbop. DavidArchie – Almost out of the studio for today! My ears are sore from wearing the headphones for so long! DavidArchie – Ah what a great day it’s been so far! Been fun recording in Utah the last few days! Heading to Alaska today! DavidArchie – Ha this tiny little girl is walking down the breezeway line carpet in the airport and posing like it’s the red carpet! So funny! DavidArchie – Woo hoo the Delta flight video with the red headedlady and smiley guy! I haven’t seen it for a while lol. Davidarchie – Wow! Alaska is amazingly beautiful! I can see the tip top of Mt. Mckinley HaHa! David really out-Archuleted himself today! At the age of 18, he made his mark on a very tough vocal piece. Singing done. Now time to mix. @realbrookewhite Tuesday is good. Here recording David’s vocals right now…you ever sat in the room with him singing and said “wow!”? DavidArchie – Everyone keeps asking me “so, what are you doing in Alaska? You going fishing?” or something along the lines of fishing lol. 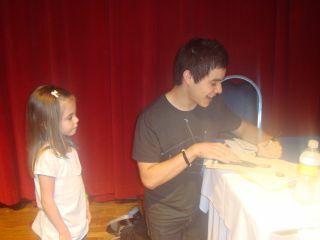 DavidArchie -Wow! I haven’t really been on the computer for a while. That’s a good thing though! I feel productive! lol. DavidArchie – Bah Bad internet connection! I have a blog to get up internet! Work with me here please! DavidArchie – This is not helpful. It’s over 200 minutes now too! I paid 10 bucks for this internet connection! 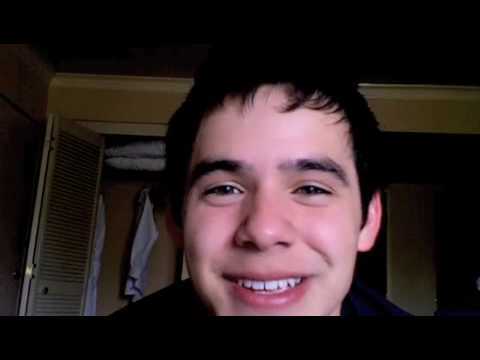 going to…..
DavidArchie – Kinda awkward but I found a good connection in front of someone else’s door! DavidArchie – Hallelujah! I thought this would never go up! DavidArchie – Michael Johns is in my neck of the woods and I’m not there to greet him! I leave the day he comes. lol Sadness. DavidArchie – Alaska show today! kbestor – One studio….2 engineers. 2 producers. 3 cans of Red Bull. try to meet Archuleta’s deadline. DavidArchie – When I grow up I wanna have a steam room/shower. Steam saves throats’ lives! DavidArchie – The landscape is amazing here. At the Alaska fairgrounds now, it’s cold but I’m looking forward to performing! DavidArchie – Oh my Heck! I had such an awesome time singing tonight!!!! Thank you so much Alaska! DavidArchie – I like being sore. It reminds me that I got a good workout. Well at least I like it when that’s the reason why I’m sore. Kbestor – Recording Boys Choir for Archuleta CD this morning. Should be the final touch on this song. DavidArchie – Goodbye Alaska! Had a blast here! One Sweet Love – Sara Bareilles is playing on the airplane. Great Song. DavidArchie – With or without you by U2 is on and I Love this Song. DavidArchie – HaHa I had my sister tweet that for me since I was driving. But taking out the sisters for dinner! Back in Utah! For a little..
DavidArchie – My little sister lost a tooth during dinner! HaHa I love family time. Tickets on sale November 9th – Cost $35 for general public – $20 for students – No children under six. David’s Vlog – David was sitting on his hands – he was told he uses them too much when talking. It didn’t last very long! HaHa! He was discussing his photo shoot for the Christmas album but couldn’t give us any details or show us any shots. Also said it was fun to have Ashlee with him for a few days and she really got along with everyone. She got to see some of the things David has to do when not performing. She also experienced the paparazzi chasing them and the recording studio. David hopes that in his next video blog he can shows us as he records. Wow! Woot! Woot! Filipino singer Charice Pempengco revealed that she had finished recording a duet with American Idol 2008 runner-up David Archuleta for his forthcoming Christmas album. And despite fans “twitting” for the young singer to disclose more details about the duet, Charice could only say that “it’s a duet” and that fans should “wait for it”. Charice also relayed a “thank you” to David Archuleta, saying that “the recording was such a pleasure to do”. Idol Live – Poll of the week: David Archuleta defeats all competitors in champion series finale. After fourteen weeks of competition, Idol Live’s annual poll of the week champion series edition has come to a close. David Archuleta took the top spot, following a two-week voting period that consisted of a whopping 10 alums from the series’ seventh season. eLyrics- David Archuleta is the third most rated Artist on elyrics.net. If you want to get the lyrics on any of his music they have it all. People Choice Buzz Polls – Don’t forget to go and vote. There are a few polls regarding David you should check out. If you are dying to get an opinion from fans, don’t hesitate to Buzz your own poll. It is very easy—just follow the simple steps and you’re on your way in just a few minutes. Keep David’s name and career in the know!!!! Moved a few boxes in the garage the other day and it occurred to me I needed new Christmas decorations to trim the tree this year! So I thought, what about David’s Christmas CDs, some of his promo cards and pictures of David with a Santa hat hanging from the tree. Oh yes, and I have all those VIP necklaces from the gift bags from I Love All Access, and don’t forget the key chains we all got! Let us all hummm now…. Ok before anyone says something, yes it’s been a slow week but I really needed this!!!!! Humor me!!!! I have died and gone to Christmas Heaven!!!!!! David’s recent blog kept me laughing for a few minutes and then I needed to watch it again and again to make sure I got everything he says. Only David can make something so simple a treasure to keep forever. Love that fact that it was his first time in Alaska and adored the “got to see cool pointy mountains and a glacier.” But when he said he was moving when he talks he’s on a bed and he likes it, it’s better than a desk, I rolled over and just laughed till I had tears. It’s great to hear him relaxed and enjoying himself. Interesting how he mentioned his voice is different from recording studio to the stage, recording every day and is really in the Christmas Spirit. He must get a kick out of Kurt Bestor as he thinks he’s really funny. Got to see his family for a few days and spent some time with friends before they go off in different directions. He forgot how nice it was to be home. Very funny and cute blog! Thanks for another great wrap-up, Pam! I’m still humming your Christmas ditty and probably will continue till October 13 when it will be replaced — I cannot lie! — with David’s carols. I love Christmastime, so I’m happy to have it start early this year.